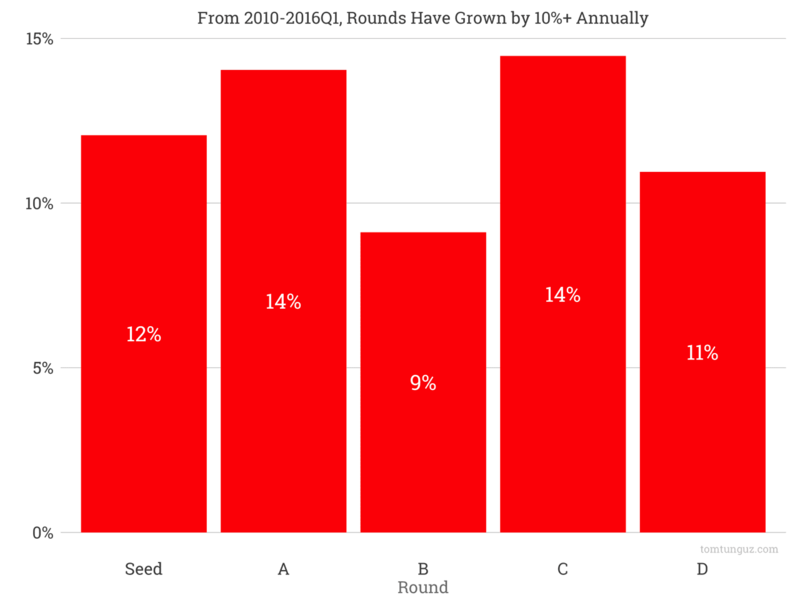 Over the last six years, seed rounds have grown in size by 12% annually. Series As have grown by 14%, series Bs by 9%, series Cs by 14% and series Ds by 11%. In that same timeframe, the median series A and series C has doubled. 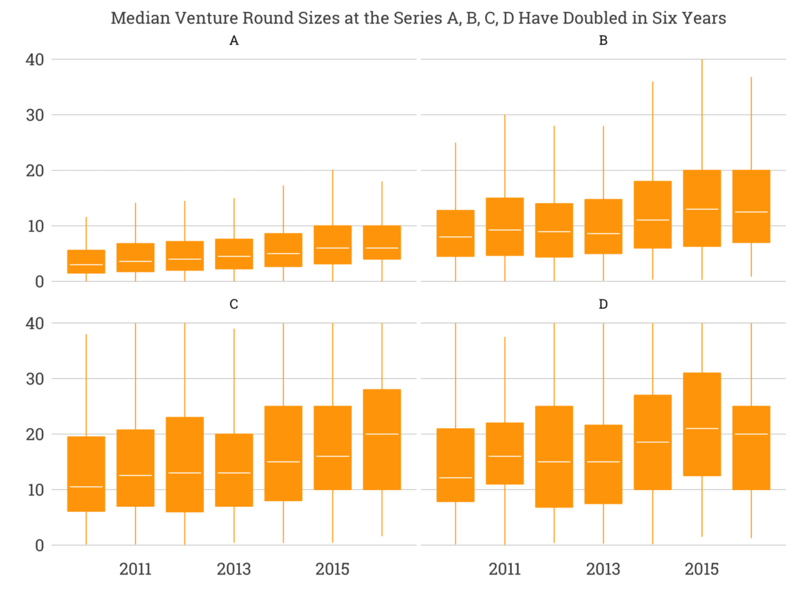 Median seed rounds have more than tripled in size. This tripling of seed round sizes is a recent phenomenon, taking place in the first quarter of 2016. 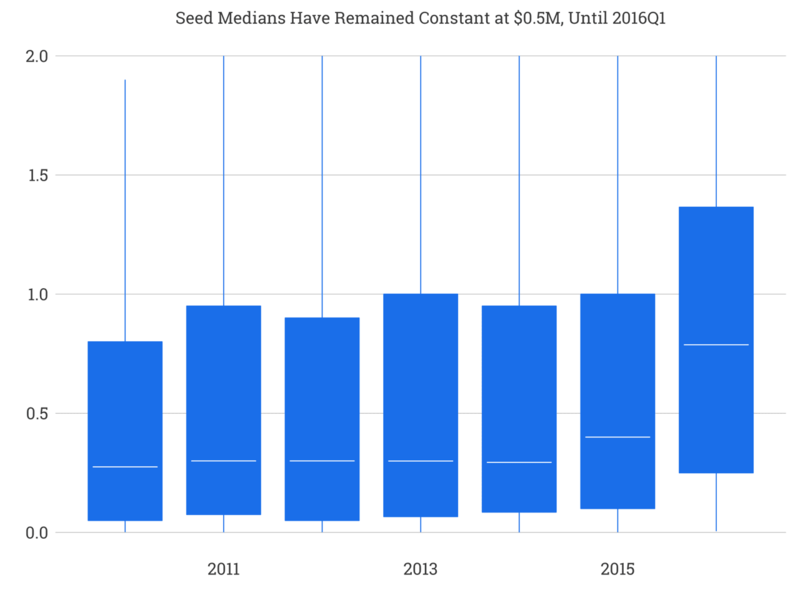 In 2015, seed rounds grew 44%, but in the four years before that, they remained relatively constant at about $400,000 median. The box plots above show the distribution of rounds. The white line in the middle of the box is the median. The upper end of the box is the 75th percentile, the lower end of the box is the 25th percentile and the whiskers above and below the boxes indicate the range of round sizes. Later stage rounds have benefited from a secular increase over the last six years. The median series A has grown from $3.3 million to $6 million. Series Bs from $8 million to $13.5 million, series Cs from $12 million to $27 million, and Series Ds from $13.7 million to $25.5 million. All of these increases are statistically significant with p values less than 0.01 over the six year time horizon. So what does this imply for founders? The seed market is a tale of two cities. The number of rounds in 2016 has declined by 50% compared to last year, but the companies that do raise capital collect more than twice as much as last year. The data suggests the market is concentrating dollars in seed stage companies, preferring to invest in fewer of them, but allocate greater resources to them. Later rounds seem to be continuing their consistent growth, likely driven by the near historic amounts of capital raised by venture capitalist in the last two years. As round sizes increase, the table stakes to enter a particular sector increases, and new entrants must follow suit. In addition, analysis of software companies indicates the milestones required to raise series As have increased in parallel with round sizes. For one subset of companies, the average monthly recurring revenue at the series A increased from about $50,000 to $163,000 (slide 10), although there is a substantial contingent of 27% that raise with no revenue. Overall, the seed market is the first segment of the venture capital market that seems to be undergoing a substantial correction. Pricing of seed round has declined substantially from last year, round volumes have been cut in half, but there is a concentration of capital in the companies that do raise. The rest of the market seems to be doing business as usual.